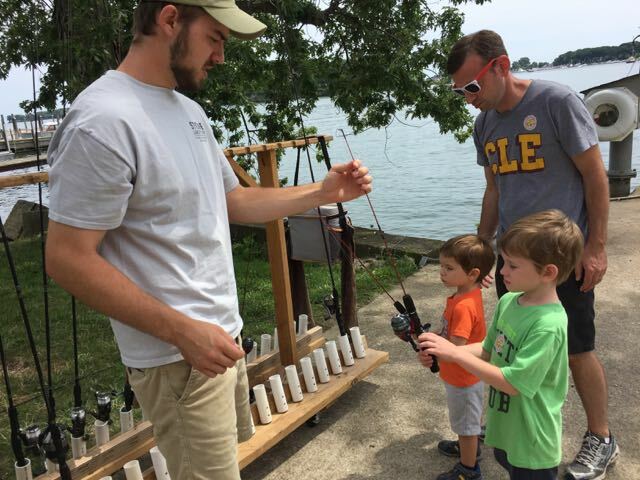 This post was written in partnership with Lake Erie Shores and Islands. 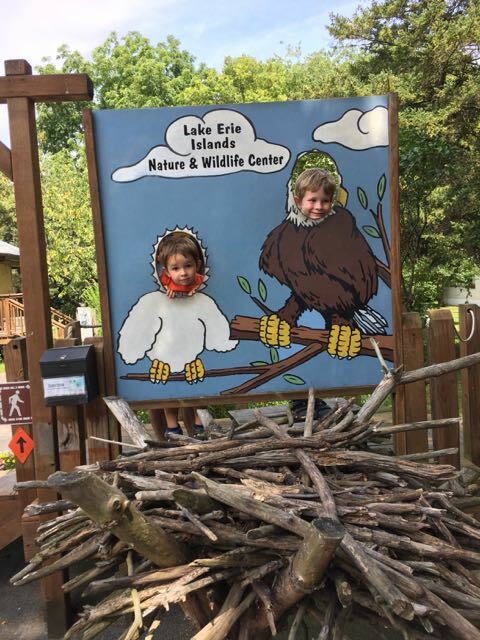 I’ve received a few raised eyebrows when I say we took our kids to Put-in-Bay while on our vacation to Lake Erie in July. 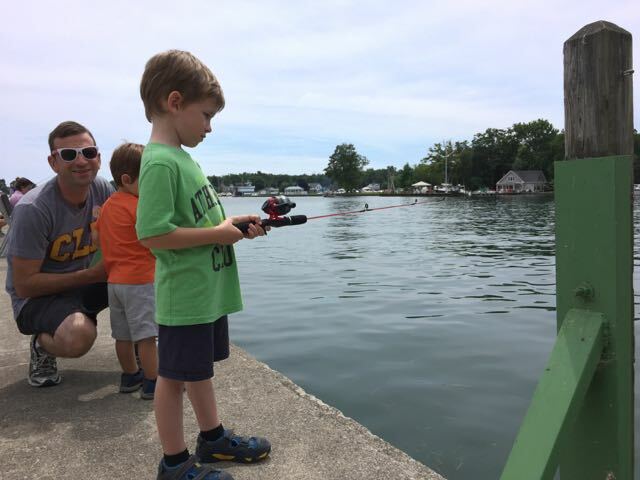 A lot of people think that Put-in-Bay is just a party island, but I’ll have you know that there is plenty of family-friendly fun to be had! 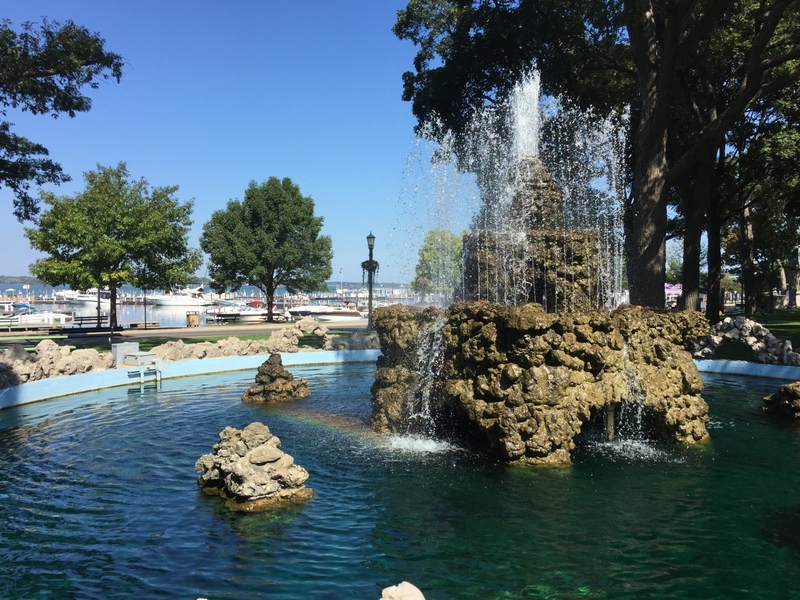 My husband and I have been to Put-in-Bay 3 times since we were married. Once just the two of us and twice with the kids. 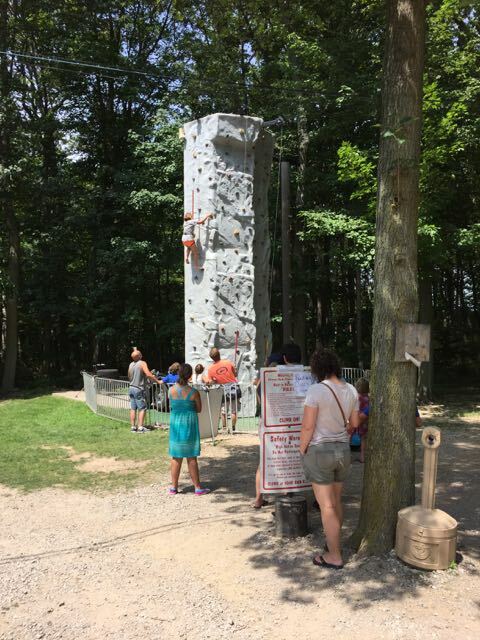 By trip three, experience (and some great input from Lake Erie Shores and Islands) had taught us a few things and trip three was probably the smoothest and most fun! 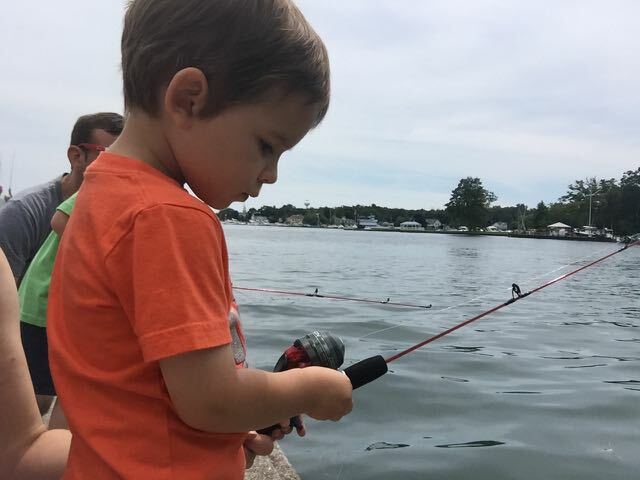 To get to Put-in-Bay, you must take a ferry from either Port Clinton or Catawba and there are two options, Miller Ferry and Jet Express. We’re kind of partial to Miller Ferry – I don’t know, it must be the name! 😉 We’ve always taken Miller Ferry to the island probably because, besides the name, it’s also, by far, the cheapest. 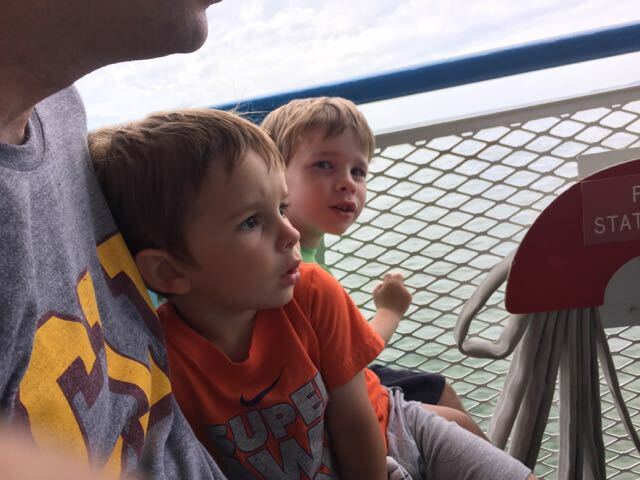 Taking the ferry is part of the experience, for the kids! Mine loved the boat ride and looked forward to it as part of our day! 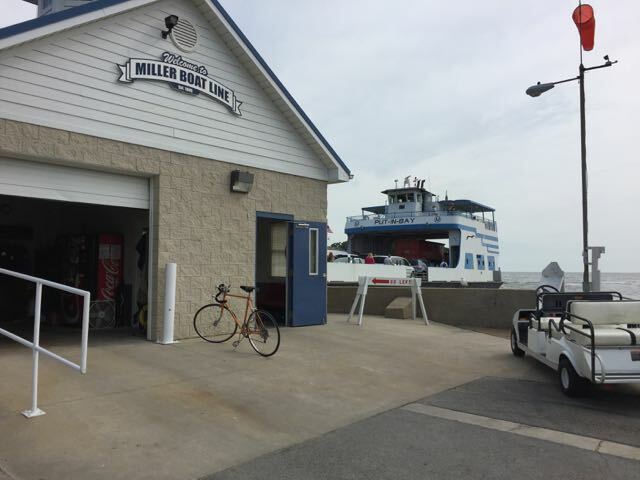 Miller Ferries run generally every half hour during the summer season. You can see the schedule here. 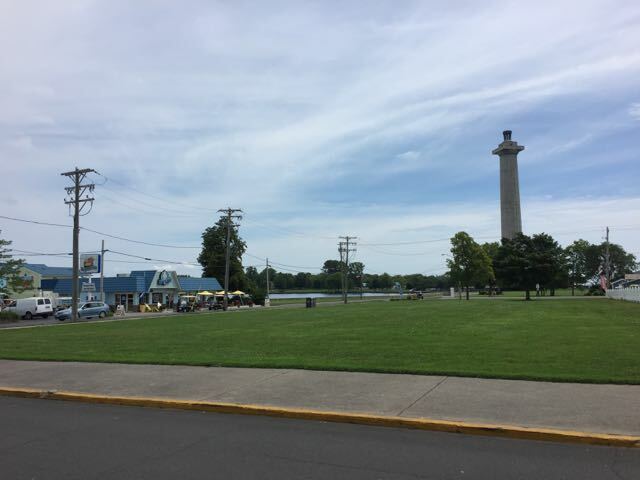 When you get to the island you’ll probably want to take some form of transportation (besides walking) to get to downtown Put-in-Bay. 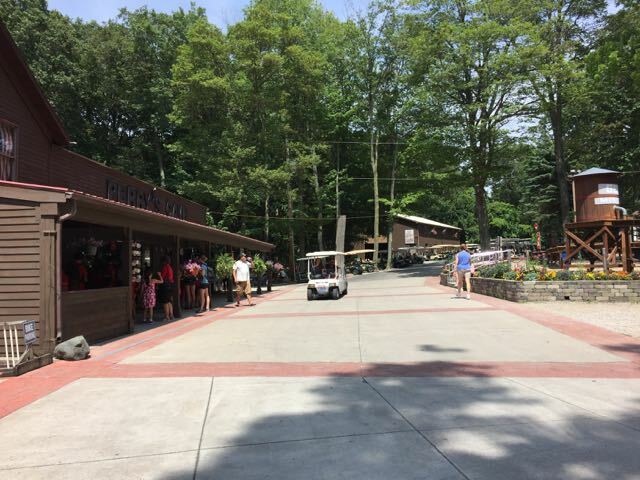 Options include a taxi, golf cart, bikes or the Lime Kiln bus, which is what I would recommend if you don’t plan on driving a golf cart around all day! 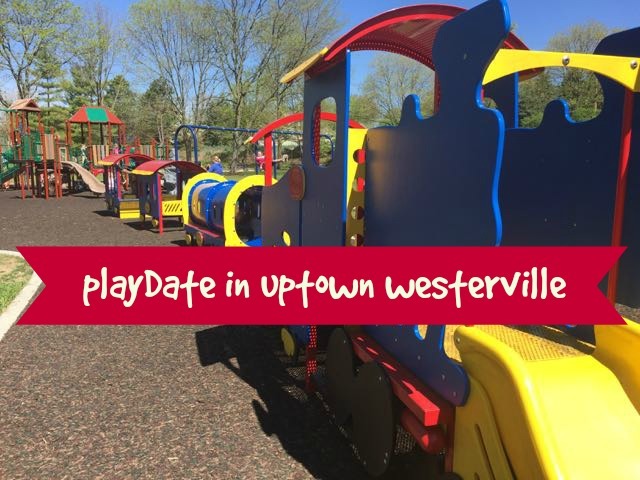 The bus is $2.50/person and children under 6 are free. 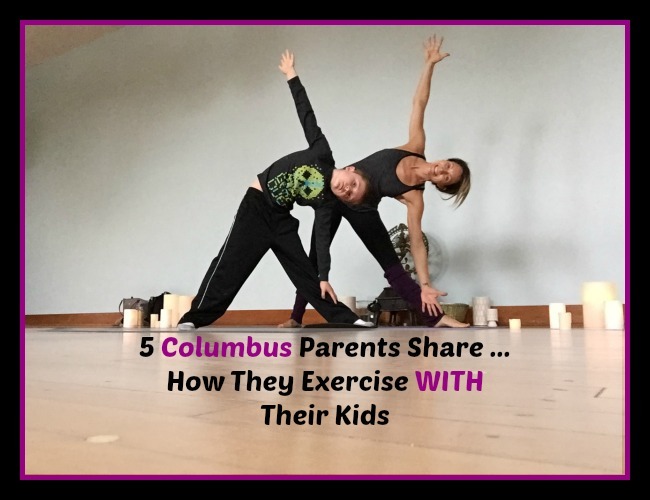 This was also part of the fun for my kids since they don’t get to ride a school bus! You can board the bus at the top of the hill after exiting Miller Ferry. Cash only! 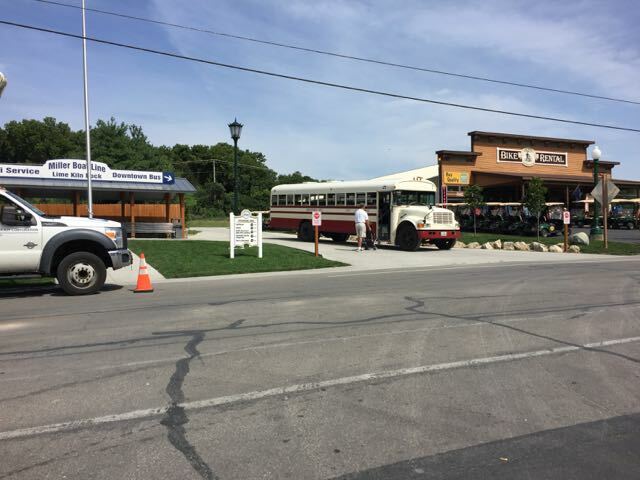 The Lime Kiln Bus will drop you off at The Depot in Downtown Put-in-Bay, and from there, most people travel around by foot or golf cart. 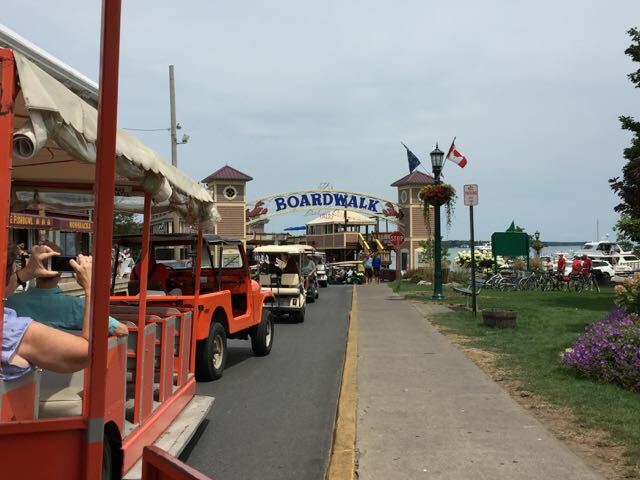 Cars are allowed on the island, but golf carts, bicycles and feet are the most common methods of transportation. 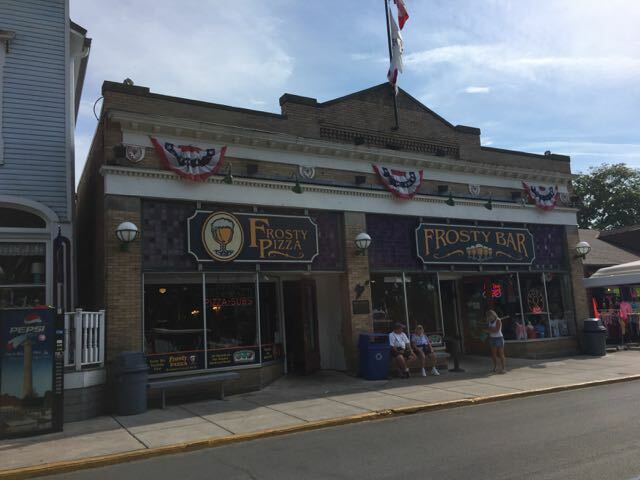 Downtown Put-in-Bay is full of restaurants, bars, shops and a few attractions, and, on our first two trips, this is the majority of what we saw. 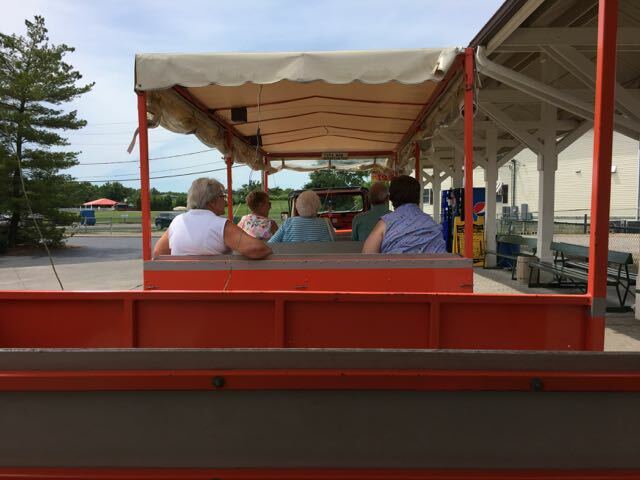 Jill at Lake Erie Shores and Islands offered us passes for the Put-in-Bay Tour Train for this trip and this tour train is what made our third trip to the island the best! I cannot recommend it enough! 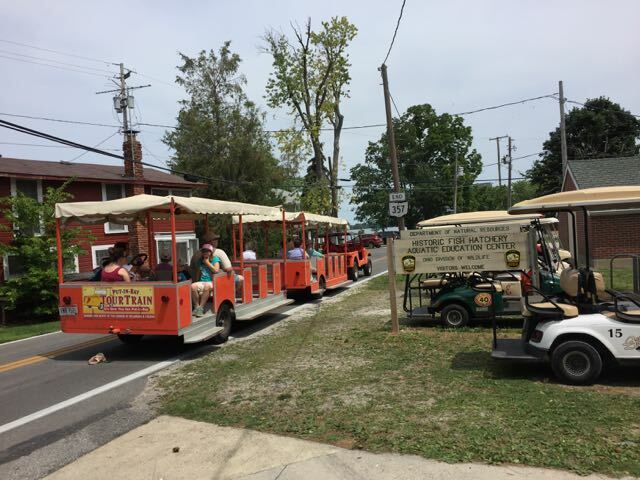 A lot of the activities I’m going to list here are stops on the Put-in-Bay Tour Train and I will note those with an asterisk (*) next to the number. The best thing about the tour train is, maybe obviously, the transportation. 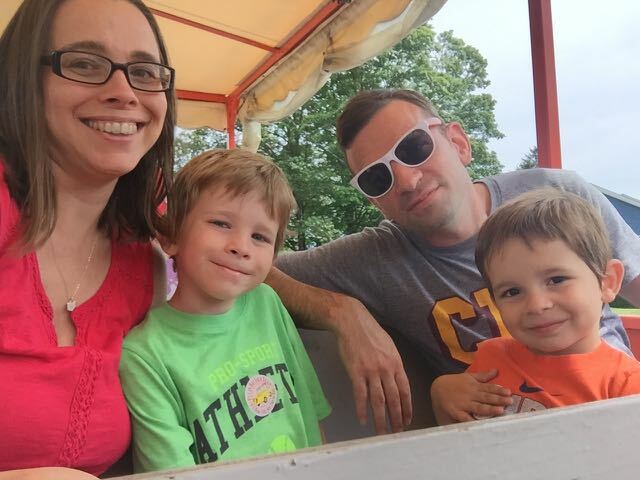 You’re simply not going to be able to walk all of these places with kids, and with the tour train, you get an education along with your transportation! We learned so much history about the island as well as what island life is like in the present day. 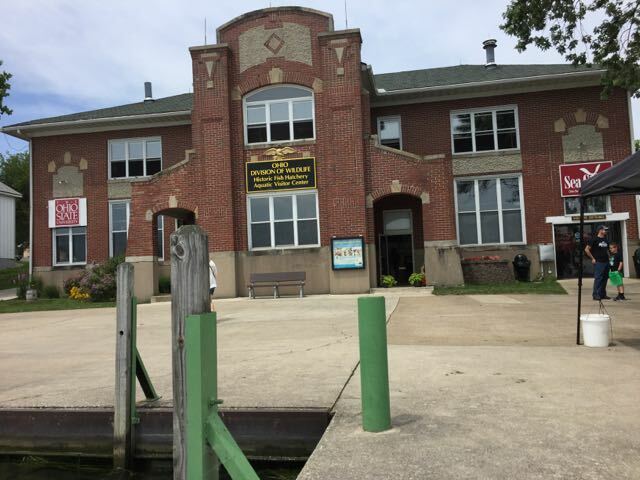 We saw the school, the only 2 churches on the island and got a snippet into daily life as a Put-in-Bay resident. I compare this with our first two visits where we didn’t see much of the island and had no idea what other things there were to do there, and the difference is night and day. When you take the tour train, you pay for one loop. You can get off and back on at each of the 6 stops, but you can only go around once. So look at the map and make sure you don’t miss a stop because you will not be allowed to circle back around to it again. The trains run every 30 minutes so keep an eye on your watch while you’re enjoying your stop. 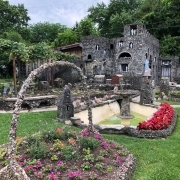 The Tour Train makes 6 stops including: Perry’s Cave Family Fun Center, Heinemann Winery & Crystal Cave, Perry’s Victory & International Peace Memorial & Visitor Center, The Doller House & Museum of Island Life, Lake Erie Islands Nature & Wildlife Center and the Aquatic Vistors Center. You can buy an Island Fun Pack which includes ferry tickets, the Tour Train, plus discounted admission to several island attractions! See all the details here. 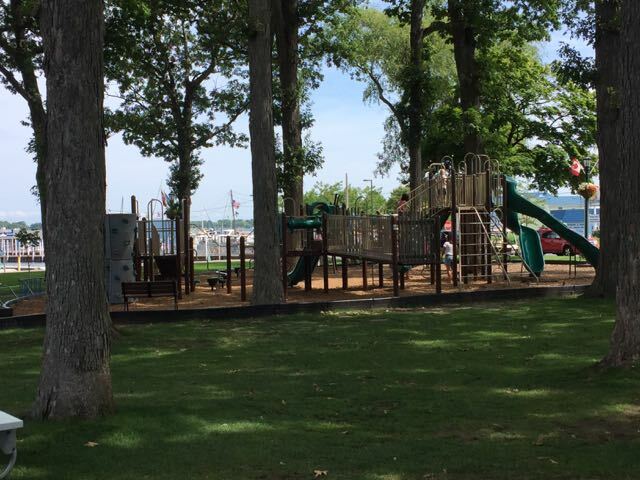 DeRivera park is named for the founder of Put-in-Bay, Jose DeRivera. It’s a beautiful, shady area with lots of picnic tables and a large fountain. 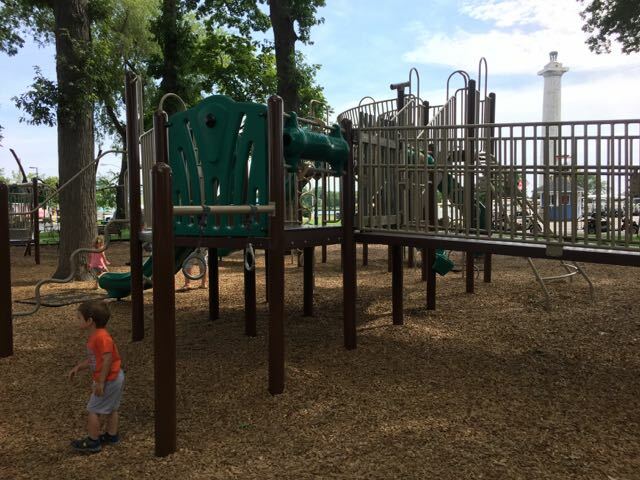 Within the park is Will’s Playground which has two play structures, one for older and one for younger kids. 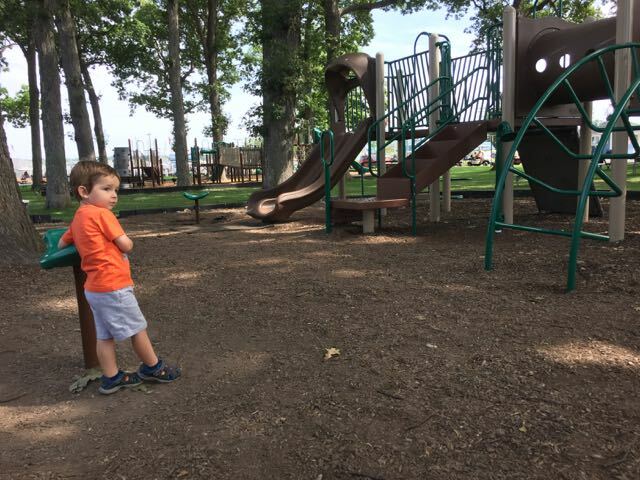 This park is a great place to come back to throughout your day to rest and regroup. There are also public rooms and showers here. 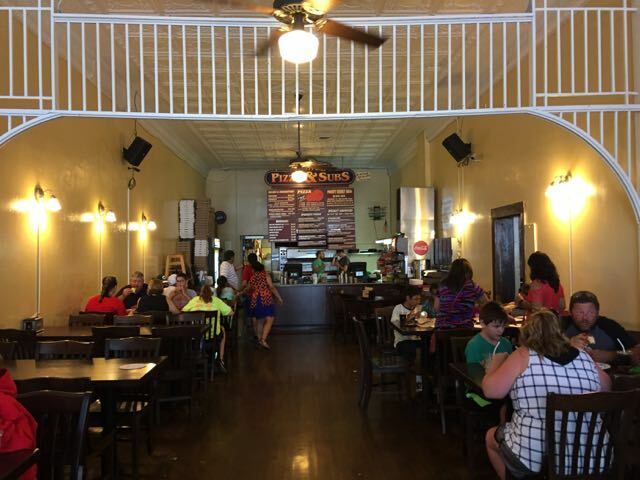 Perry’s Cave and Family Fun Center is all about family fun. 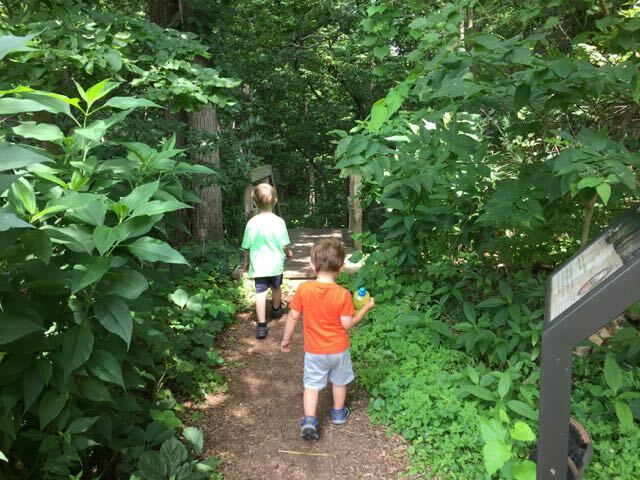 Options for activities here include Perry’s Cave, Gemstone Mining, The Butterfly House at Put-in-Bay, War of 1812 Holes Miniature Golf, Gotcha Laser Tag, Fort aMAZE’n, Rock Climbing Wall, Antique Car Museum, gift shops and DanDee’s Snack Shack. 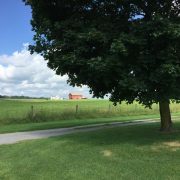 The Tour Train offers one general stop at Perry’s Cave and all of the activities are within a short walk of the drop off. I’m going to tell you about the two things we chose to do when we were here below . . . 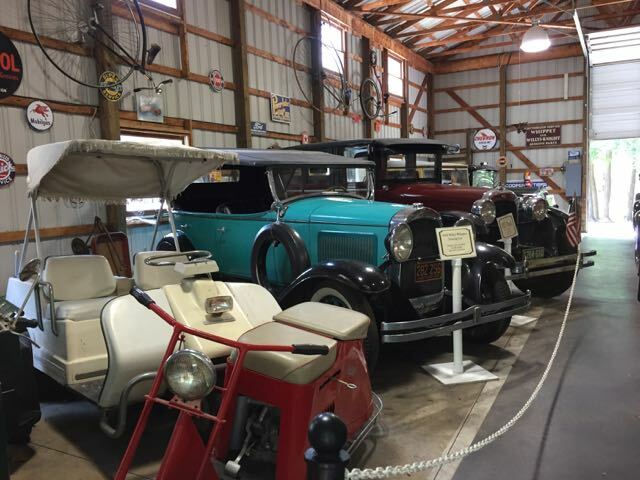 Housed in a large barn at Perry’s Cave Family Fun Center, the Antique Car Museum is free! 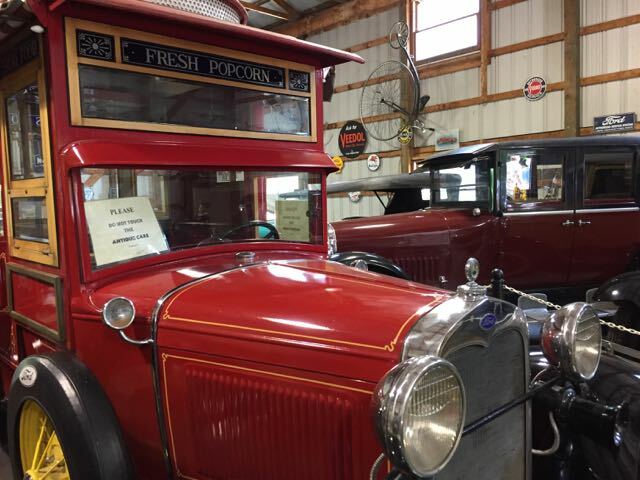 There are rare Ford Model T’s and A’s, a popcorn truck, and other auto-related memorabilia! 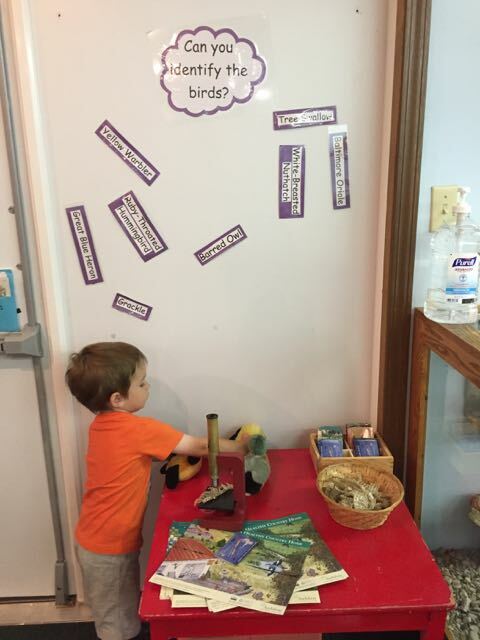 We chose to do the The Butterfly House at Put-in-Bay as our main activity at Perry’s Cave Family Fun Center. 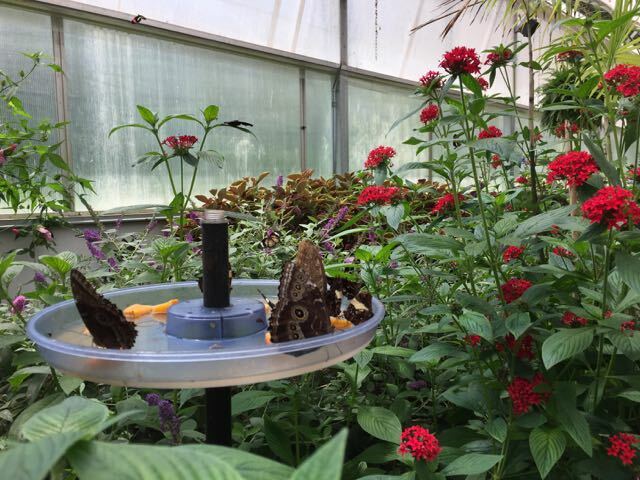 We all enjoyed the Butterfly House which was FULL of butterflies! The brochure says “hundreds of butterflies” and I believe them! Though no touching is allowed, it was not uncommon for butterflies to land on us and we were able to see them up close. 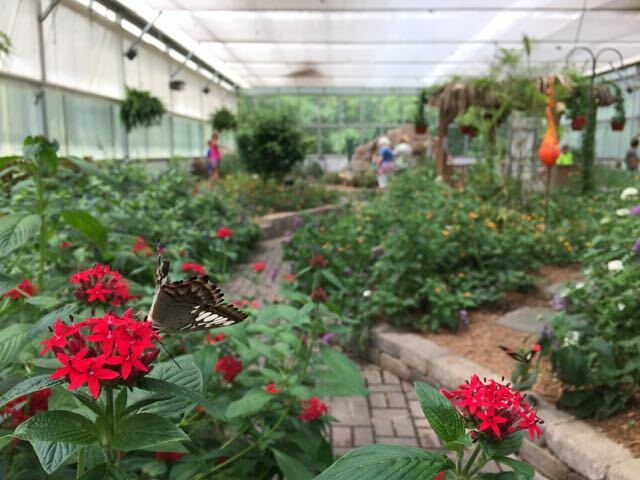 In addition to walking among the butterflies, there is a large gift shop with educational gifts and lots of butterfly souvenirs. 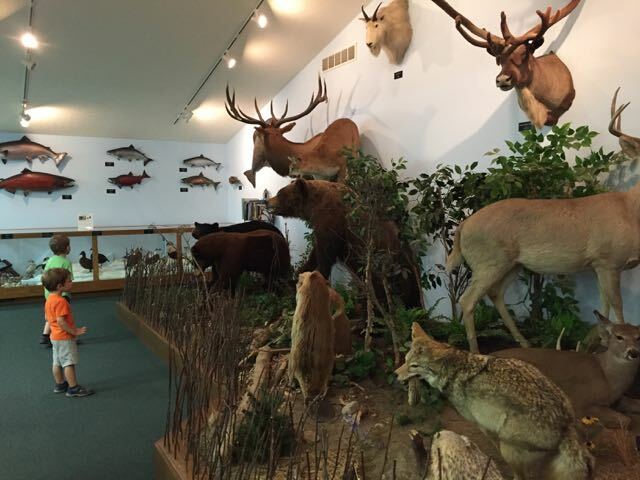 The AVC is operated by The Ohio State University in partnership with Ohio Department of Natural Resources. 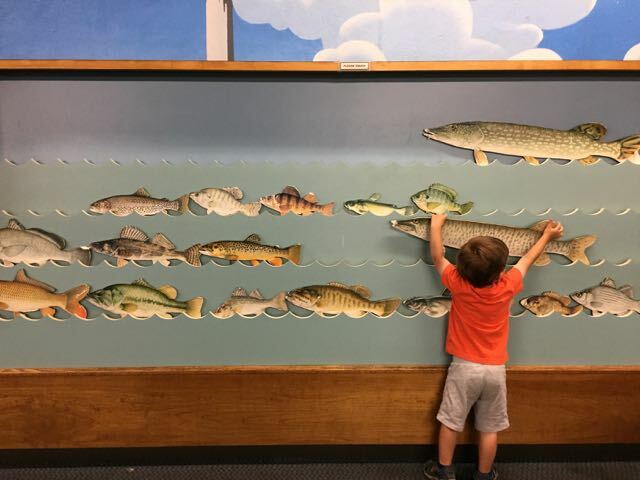 It was a fish hatchery that closed in 1988 and became an educational facility which includes the OSU Stone Laboratory, OSU’s island campus on Lake Erie! 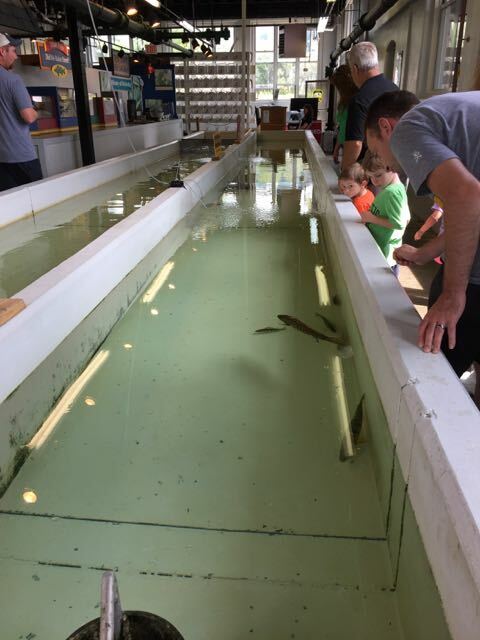 If you take a walk through the center, you can learn about Ohio fishing, research projects and view the live fish in open tanks. There are some kids activities, a wall puzzle and coloring sheets. 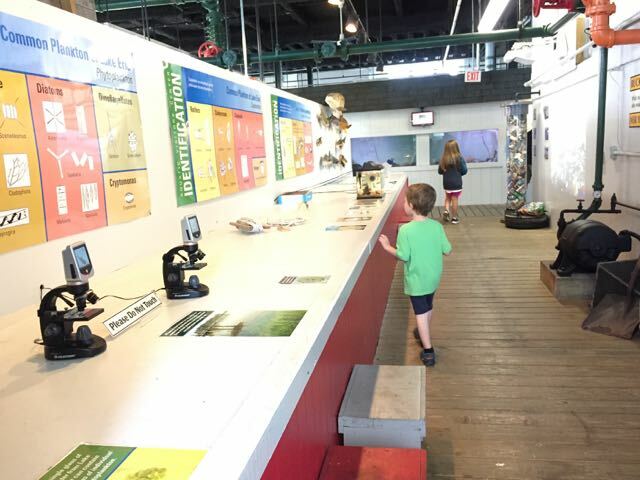 In the summer, the center hosts kids programs on Saturdays. 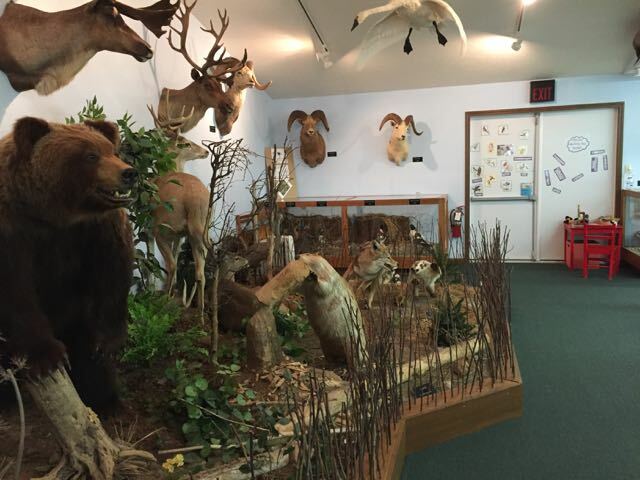 The Nature and Wildlife Center houses what was once a private collection of mounted wild animals, many from Alaska. 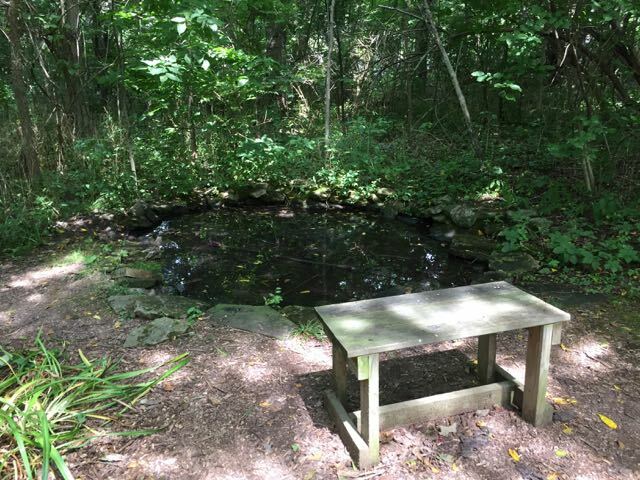 In the back of the property, there is a frog pond and a nature trail that will take you in a complete circle. 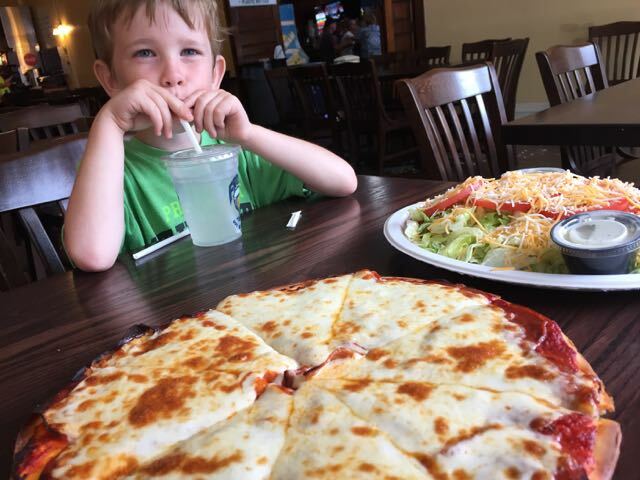 Frosty Pizza is an easy, family friendly stop for lunch or dinner. 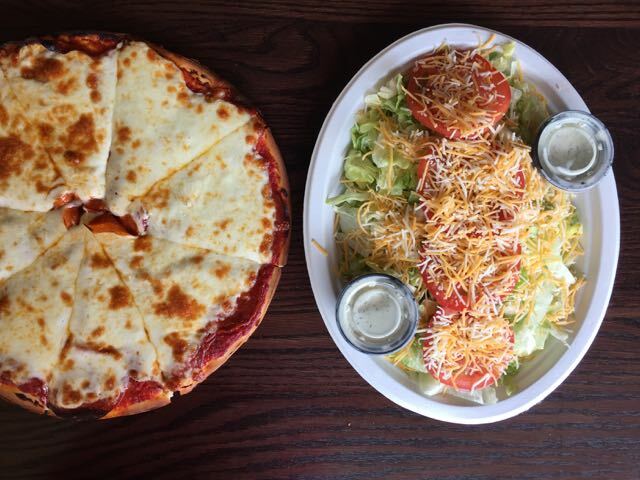 We got the Family Deal which included a large pizza, salad, breadsticks and 4 drinks for $30. You can’t miss Perry’s Memorial from most of the island! The grounds and Visitor’s Center is open to the public but the observation deck is closed for repair in 2017. 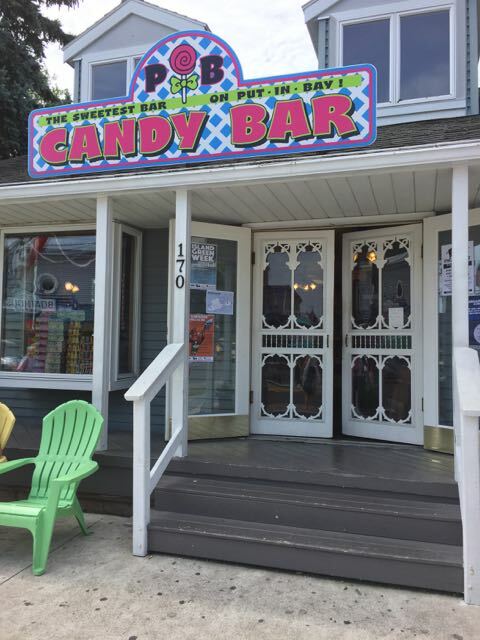 The PIB Candy Bar is a fun stop for tons of candy options and ice cream! 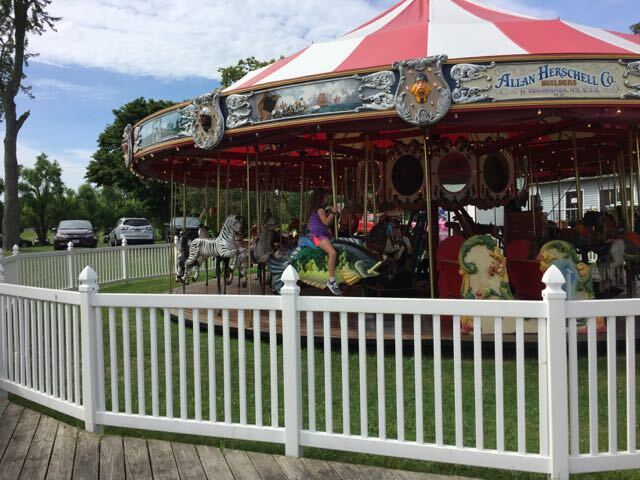 Kimberly’s Carousel provides musical accompaniment to much of the downtown area and is lots of fun for kids and adults alike! 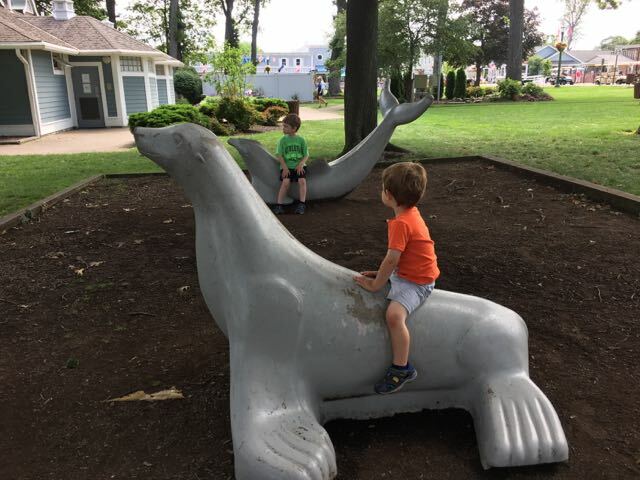 Are you surprised there are so many family-friendly things to see and do at Put-in-Bay? 🙂 All of these activities give you plenty of options to enjoy the island with your kids! 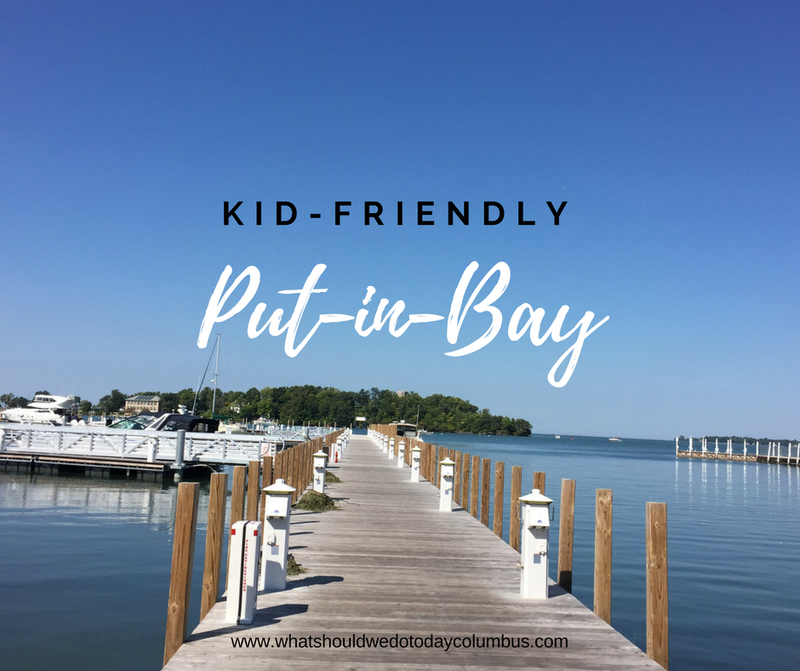 If you’re planning a trip to Lake Erie Shores and Islands, make sure to check out my post Exploring Ohio With Kids: Bellevue for another fun day trip in the area! This was so helpful! Thank you!! We are thinking of going in August. Where did you stay? Any suggestions on hotels or house rentals? Great Family Fun and memories to be made! I drive one of the tour trains and I have loved doing it! 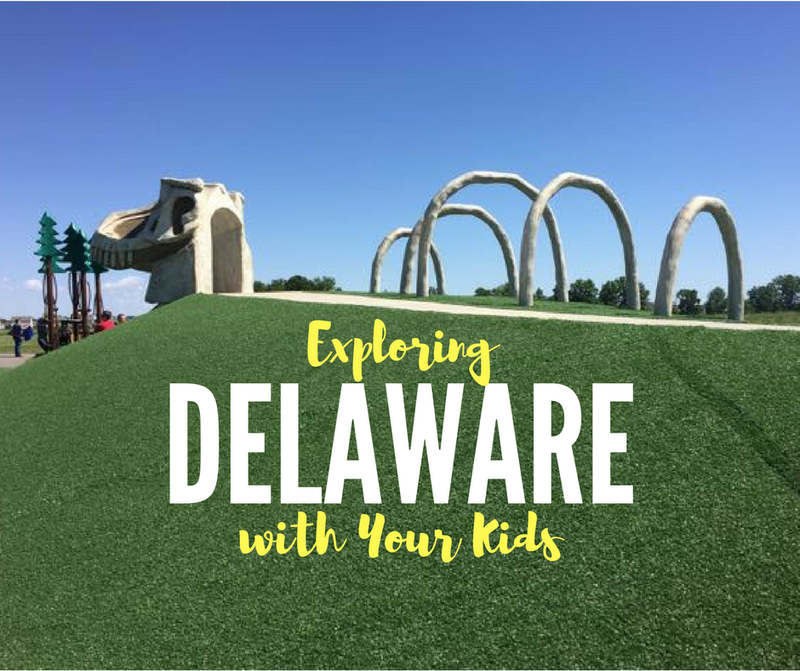 So much history and family fun things to do on the island that many never get to see and experience. You took some great pictures and I too want to thank you for posting this. You’re welcome!! Thanks so much for commenting! As you can see from the post, the tour train was a highlight of our trip! 🙂 Thanks for what you do! I have always heard it’s a party island and mainly for adults. 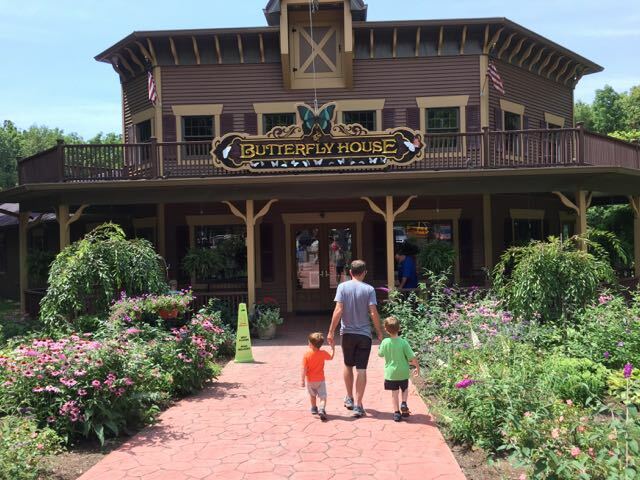 So glad to see a family experience there and now we can’t wait to go! 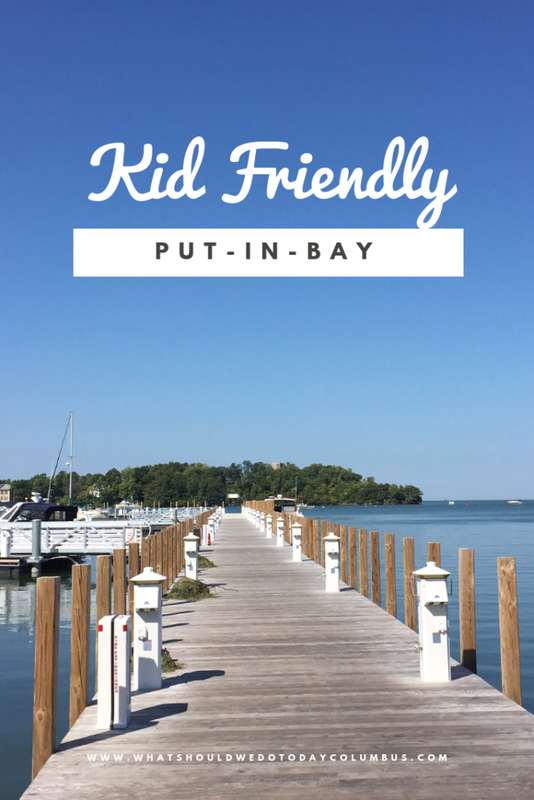 We’ve been to Put-in-Bay a couple different times and may be headed there again soon. It’s a full day event! 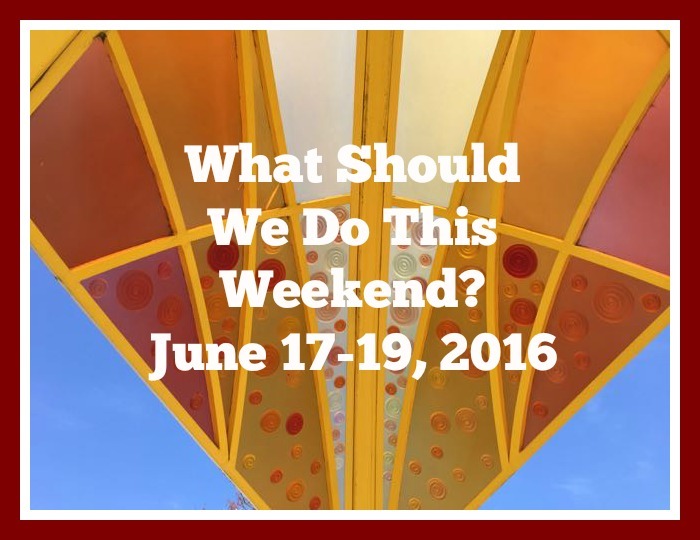 Looks like the perfect weekend trip! I love your photos!! Thanks for this… I always forget about Put in Bay and it’s so close! You’re welcome!  It’s a great distance from Cbus! It’s a great distance when you really feel like being at the beach but don’t have the time for a trip to the ocean!